Heraldic banners fluttered from the pavilion’s roof, depicting the personal crests of every seated celebrity and somehow the lilies had been grown in mid-winter, which nodded their noble heads solemnly along the parapet. From our lowly viewpoint the royal family and their guests resembled a row of gorgeous dolls, clad in brilliant hues, sable-lined against the cold and so laden with precious stones that they glinted blindingly in the flat February sun. The next morning, Woody Asap on Channel Twelve is waving his white scaly hands all over the state map. Jackson, Mississippi, is frozen like an ice pop. 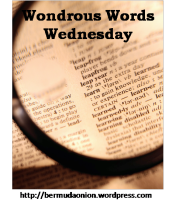 Wondrous Words Wednesday is a weekly meme hosted at Bermuda Onion where you can share new words that you’ve encountered or spotlight words you love. Feel free to get creative! If you want to play along, grab the button, write a post and go add your link to Mr. Linky! 1. characterized by excessive piousness or moralistic fervor, especially inan affected manner; excessively smooth, suave, or smug. 2. of the nature of or characteristic of an unguent or ointment; oily;greasy. 1. (initial capital letter) a group of 14 books, not considered canonical,included in the Septuagint and the Vulgate as part of the OldTestament, but usually omitted from Protestant editions of the Bible. 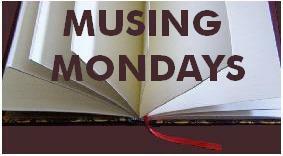 2. various religious writings of uncertain origin regarded by some asinspired, but rejected by most authorities. 3. writings, statements, etc., of doubtful authorship or authenticity. The perfect breakfast is probably the one you eat when you are newly in love. That slight euphoria, the buttering of toast, the flutter of love in your stomach, is possibly a breakfast to beat all breakfasts, if not all meals. We are afraid to change because we think that, after so much effort and sacrifice, we know our present world. And even though that world might be the best of all worlds, and even though we may not be entirely satisfied with it, at least it won’t give us any nasty surprises. Last week I wasn’t able to post a review, and it killed me inside. I have been working so hard to get this blog back to being up-to-date and filled with new, regular content. However, I also have to acknowledge I have M.E. and sometimes I just can’t write or post something when I’d planned to. Normally at this point I’d point you to my personal blog to explain more thoroughly, but as I haven’t written anything beyond quick monthly reviews for the past few months, I doubt it would help (though if you are interested in my past experiences of living with disability as well as random stuff about my life and thoughts thrown in, feel free to peruse the years of content available there). So, the short story is I went to Scout camp a few weeks ago and it has taken til now for my body to realise it owes me plenty of extra pain and exhaustion, making coherent productivity very difficult. I am hoping that once I’ve improved enough I’m not only just keeping up with this blog, I’ll be able to have reserve content and posts for you to enjoy even when my health prohibits me from writing decent stuff (unlike this unedited stream of thoughts as an excuse for a Monday musing). Even after years of being housebound it’s often hard for me to accept I can’t be as productive as I’d like to be. I know I have nothing to apologize for, but I also know not every reader of this blog knows my health situation and I just wanted to share with you that sometimes I will miss posts and take time replying to comments, but that doesn’t mean I’m not constantly thinking of what I will write as soon as I’m able. If ever you come to my blog and don’t find something new to read, you can always check out my favourites. G hates shortcuts. He hates synopses, sound bites, and short attention spans and blames them all on America. 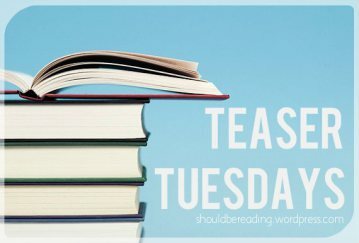 Today’s question is about favourite books. Normally I would say Cloud Atlas by David Mitchell but know I’ve mentioned it quite a lot recently so am fairly certain you all know that’s one of my favourite books. My other favourite book has to be Lord of the Rings by J.R.R. Tolkien. I have to admit I was hesitant to read it as I hated The Hobbit, but after the first LotR film came out I mentioned that to my mum and she advised me to read LotR anyway (she also hated The Hobbit and has dyslexia so finds reading quite difficult at times), I’m so glad I did (obviously as otherwise it wouldn’t not be my favourite book). While it is considered a classic, and the writing style can sometimes be awkward, it is one of the most beautifully written books I’ve read. So beautiful that I instantly knew I had to read more of Tolkien’s books. The two that stand out most to me (other than LotR of course) are Tales from the Perilous Realm which is a collection of 4 short stories – The Adventures of Tom Bombadil being one of them. Tom Bombadil is possibly my favourite character from LotR and this entire story is told in his lyrical speech. The second is Letters from Father Christmas which is a collection of letters he sent to his sons each year from Father Christmas. It was put together by one of his sons, complete with the original drawings and it has rated itself among my top Christmas books. I also own The History of The Lord of the Rings but have to admit I’m a little intimidated after a good stab at trying to read The Silmarillion and not getting far. I am sure I will give both of these a try at some point, but not this year as I already have a full quota of ‘heavy’ books on my tbr list. Have you read any other books by J.R.R. Tolkien? If so, what did you think of them? Mindy Kaling is most well known for her work on The Office (US) as a writer, actor and producer. 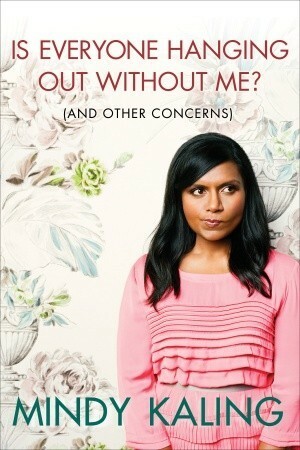 She is also the creator of The Mindy Project. In her autobiography she shares anecdote, advice for teen girls, and how she went from starving artist to success. I haven’t seen any of Kaling’s work, but someone in a swap sent me her autobiography Is Everyone Hanging Out Without Me (And Other Problems) and who can resist such a pretty cover. The main thing that stood out for me was the inclusion of lists. There are lists of questions and answers, lists of alternate names for things, lists that show Kaling’s break-down of possible tropes, etc. To be honest, this is was the main thing I loved about this book. It made it into a quick read, while showing more of Kaling’s personality than a straight-up autobiography would have, not to mention Kaling’s comedy which is clearly strongest in this format. There were many moments during this book that made me smile to myself, however it wasn’t nearly as funny as I was expecting from a comedy writer and actor. Perhaps it’s just my lack of that kind of humour, but in my opinion a lot of felt like it was trying too hard, and the rest was bordering on laugh out loud but somehow missed the punch line each time. However, as a writer, I am always interested in other writers’ work habits and how they get ideas to paper so to speak. While the majority of the book is about being a performer and getting through the day to day parts of life (friendship, work, fashion, being ‘chubby’ [her word, not mine, and quite frankly offending that she thinks she’s fat], there is a section on writing which I really enjoyed, though I wouldn’t say that in itself would be enough of a reason to pick this book up. There are a few photos throughout the book, which she then describes or explains. The only problem being that they are in black and white and very small, when Kaling is writing as though we can see both the colours and the details of what she’s wearing, etc. For me this simply made the book seem cheap (unlike the gorgeous cover), and it was irritating that I could barely make anything out as that seemed to defeat the point of including the photos in the first place. Unless you are a huge fan of Mindy Kaling, I have to admit this wouldn’t be anywhere near the top of my recommendations list. That said, if you’re looking for something easy and girly to ease you into non-fiction this would make a great book for you. I realise this review isn’t glowing, however I am giving away my copy of the book, as I feel it’s only right to pass it on. Entering is as simple as pressing a button on rafflecopter, though I’d love it if you followed me on Twitter or Goodreads or commented on this post as well. This giveaway is international (I’m willing to send it anywhere my post office will let me), and ends midnight Sunday 11th September (GMT). Sorry this is up a little later but thought better late than not at all. When I graduated my aunt Sreela and uncle Keith gave me the single best present I’ve ever received: a professional-level karaoke machine. I don’t know if they were aiming to become my favorite aunt and uncle for all eternity, but that was the result. I'm currently working on this blog so apologies for any sudden weird changes going on.